The Authentic Dissertation is a road map for students who want to make their dissertation more than a series of hoop-jumping machinations that cause them to lose the vitality and meaningfulness of their research. Students and tutors are presented with practical guidance for the kind of alternative dissertations that many educators believe are needed to move Doctoral and Master’s level work beyond the limitations that currently stifle authentic contributions for a better world. Drawing on his Cherokee/Creek ancestry and the Raramuri shamans of Mexico the author explores how research can regain its humanist core and find its true place in the natural order once more. Four Arrows provides a degree of "credibility" that will help graduate students legitimize their ideas in the eyes of more conservative university committees. 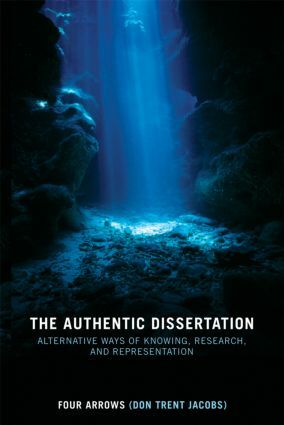 This inspiring book will also help academics who sincerely want to see these alternative forms but are concerned about the rigor of "alternative" dissertation research and presentation. The goal of this book is not to replace the historical values of academic research in the western tradition, but to challenge some of these values and offer alternative ideas that stem from different, sometimes opposing values.